We’re getting even farther away from pulp covers this week, but I stumbled across this website the other day that proved to be a great way to waste a whole lot of time and I wanted to share it with you-all so I wouldn’t be the only one whose productivity has drastically declined lately. Its complete name is Comic Book Characters: Public Domain Super Heroes, and it’s a great introduction to a subject that I don’t know a whole lot about. This week I’m presenting a half-score or so of super-powered females from the sublime to the ridiculous (okay, more inclined to the ridiculous), most of which are totally forgotten today. But we’ll start with one whose latest incarnation (though it has little in common with the Golden Age original, except for some rather obvious assets) is still gracing the pages of funnypapers even today. 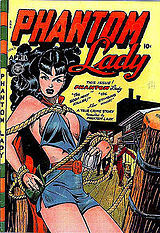 The Phantom Lady (first appearance: Police Comics #1, 1941), daughter of a United States senator and crime-fighter extraordinaire (Meghan McCain, eat you heart out), actually isn’t super powered, though she does have a “blacklight” flashlight that projects darkness (okay) and makes her invisible (I can’t imagine how that works, because she does have to hold the thing to shine it on herself). The prominent socialite has a secret identity but doesn’t wear a mask, so how she keeps her identity hidden from her father and her fiancee (just to name two members of the social register) is something of a puzzle. Perhaps they are mesmerized by her prominent assets. Lady Fairplay, Goddess of Chastisement (Bang-Up Comics, #1-3) has “unlimited energetic powers.” No, I am not making any of that up and no, I will not comment any further. Fantomah (Jungle Comics #2, 1940) is a mysterious goddess-like being whose magical powers make her virtually omnipotent. She’s probably the only female who chooses to appear in a hideous guise. 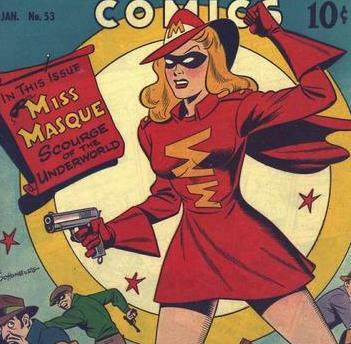 Miss Masque (Exciting Comics #51, 1946) is just another crime-fighting socialite. Vooda (Vooda #20, 1955). 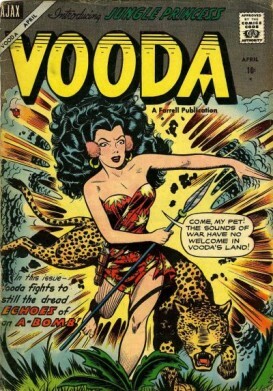 The only background gig more popular than socialite with crime-fighting females appears to be white jungle goddess. This white jungle goddess has a pet leopard and a spear. The fact that she first appeared in issue number twenty of Vooda makes me wonder what was going on in the previous nineteen issues. Moon Girl (The Happy Houlians #1, 1947) is actually not from the moon, but hails from Samarkand. She’s another fighting female who’s never been beaten in battle and can’t take a boyfriend until she can find someone who does (and you thought that Red Sonja was an original idea). She has a moonstone which “makes her superior to any man,” which is an okay super-power, but makes me wonder how many women can beat the crap out of her. Interestingly, she appeared in a variety of EC comics. Bulletgirl (Master Comics #13, 1941) is, naturally, Bulletman’s girlfriend. She discovers his secret identity so he obligingly made her a “gravity regulating helmet” so they can go on crime-fighting dates together. The Girl Commandos (Speed Comics #23, 1942) are, granted, not terribly exciting, but were they the first all-woman team in comics? I don’t know. Blue Lady (Amazing Man #24, 1941). I include her just because in her secret identity she’s a novelist. Finally. A superhero writer. It’s about time. Marga the Panther Woman (Science Comics #1, 1940) appeared in Science Comics, so you know her origin has to be steeped in technical detail. And it is. It seems she’d been raised by a group of black panthers (although they don’t specify, I’m assuming it was the feline kind) and was “inoculated” with their powers. I include her also because I found an entire story starring Marge on-line, and thought you-all might like to see a page of comic book art from 1940.